The Fallen Children is an updated retelling of John Wyndham's The Midwitch Cuckoos, a book I read about 7 years ago and absolutely adored. I definitely think this leans more towards John Carpenter's enjoyably bonkers Village of the Damned than Midwich Cuckoos though, inspiration wise- only a selection of women are found to be inexplicably pregnant rather than all, and there is a great plot emphasis on the missing child- aborted in TFC, dead at birth in VotD which I do not recall even featuring in Wyndham's original (though there is a gender imbalance of 30 girls and 31 boys). It's a really successful transplantation of the story into the 21st century and focuses thematically on the idea of the mob mentality and their angry, auto-hostile judgement, the fear of the 'different' and the difficulties faced by young people in defying expectations, clawing at the slippery scraps of social mobility and the crippling lack of options to those born into poverty. One evening, the residents and everyone in the immediate vicinity of Midwich Tower black out. It's at night, so many people miss the odd event entirely. However, in the days that follow, our narrators realise that they are all inexplicably pregnant, and that their babies are developing at a supernaturally fast rate. The four young women become the targets of hate crime and violence as they try to discover what happened that night, how come they can read each other's thoughts and feel the others' emotions and how the hell are they going to be able to look after babies. The book was really effective at creating an atmosphere of menace and hostility as it becomes more apparent that the characters are pretty much under siege by their neighbours. It showed how quickly people can turn on those they perceive to be different or dangerous. 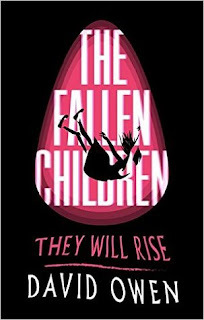 Interestingly, The Fallen Children focuses on the lives, emotions and reactions of the young women that find themselves pregnant, something that until now nobody has explored in any great detail. Here, they are 17 (ish) year old Keisha, a former bad girl that's turned her life around, studies hard and has set her sights on university as a route out of the poverty of the Midwich Towerblock. She is furious and disgusted at the violation of her body and mortified that after all her efforts to make something of herself, she is just another estate girl with a baby. Her former friend Siobhan, directionless and damaged also finds herself in a similar situation. She is furious about the hijacking of her body and is most vocal about doing something about it (note: I felt I was supposed to be disgusted by Siobhan being overweight as it was referenced frequently and commented on by more than one character- that just didn't really feel right to me...I think that made me like her more because people were being so horrible to her). Third victim is timid 14yo Maida, a Muslim girl trapped into a future she doesn't want who sees this baby as an opportunity to change her course, and a nurse in her 20s, Olivia, who had previously known herself to be barren and so is overjoyed at the idea of being a mother by any means necessary. I don't recall any sections from Olivia's POV...The last narrator is Morris, ex-boyfriend of Keisha, in trouble with the local thugs, under financial pressure from his family and debtors and, incidentally, not pregnant. Written in alternating perspectives, I honestly quite struggled to distinguish the voices of the narrators as the POV switched between them- perhaps it's because dialogue continued through some conversations despite the POV switch? I've never really had this problem before with multiple narrators. It would've flowed better for me if the characters' Voices were a little more distinct, if they exhibited more of their personality through the way they spoke and thought- they were just a little bit too similar to keep them all separate and distinct in my head. I thoroughly enjoyed the novel and felt it kept up a good pace, kept that oppressive atmosphere of fear and hostility, kept that ticking tome bomb of the imminent baby and the race to find out the truth about the Night Out...however, I did feel that after the babies arrived, it lost its momentum somewhat and became a bit more confused with its messages. I really did not like the attitudes of Keisha and Maida regarding Siobhan's successful attempt to end her pregnancy. Like, even if it's a mysterious alien baby that you've no idea where it came from, hearing characters direct hatred, judgement and pain at a person for terminating a pregnancy (ever a supernatural one) leaves a bit of a nasty taste. I get that the super-powerful-babies were physically preventing their carriers from directly inflicting harm on them (that was really well done throughout the narrative- it really feels like the girls are absolutely at the mercy of the fetus inside them) like when Siobhan tried and fails to step off the roof, and when the fetus erase the word "abortion" from their mothers' minds- that read like an unnatural manual override from a parasite within...but to hear some of the post baby bile directed at Siobhan by her former friends just didn't sit right and just didn't feel like it was part of the same book. Like, the baby is out of you now, act like a human. Once the babies are born, we drop Siobhan as a narrator and pick up Maida instead, who suddenly comes across as Children Evangelical and is all for unleashing them on the world. I really liked how the latter part of the book the shifts the focus onto the idea of belonging, it rescues the third act. Zero, the sole male Child, feels adrift and angry because his twin did not survive- there's an interesting question about nature and nurture lurking under that storyline that asks to what extent we are in control of our own behaviour and destiny. Similarly excluded and lost, Maida feels like she has created something extraordinary but cannot truly be a part of it- Marvel and Helena, the Female Children, share a bond that she cannot ever hope to experience. During these later section of the book, the characters are beginning to make sense of the similarities and joining the dots between the Midwich occurrence and a similar one in Cornwall, a nice little nod to the (possibly Cornish) fictional village of the source story. There is a lot of delicious mystery left unsolved because sometimes things cannot be explained. So all in all, it's mostly really good and is definitely an interesting and engaging modernisation- I would definitely recommend The Fallen Children as a fast paced kind-of-mystery about teens placed in impossible situations and having to battle against their whole neighbourhood just to live their lives- I loved the setting and the updating of classic sci-fi, thought the themes of prejudice, difference and that lack of autonomy, either socially or bodily were explored well. I liked the evolution of the story into a story of belonging and being in control of your own direction, but I felt that it fell down by its characters a little. I just couldn't fathom their behaviour- towards Siobhan after the births, Maida's super-villain story arc, how Morris just seemed constantly in denial and hopelessly useless. Maybe that's just totally acceptable teen logic, I dunno.